This is the third part in a series of posts that are dedicated to security system concept in DataObjects.Net. The first part contained common considerations and bits of theory, the second one was about the approach in development and the requirements to security system. In this part I'll describe main blocks of security system architecture, i.e. 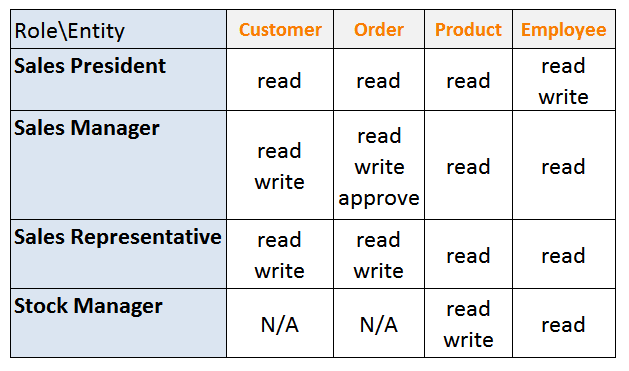 roles & permissions. I won't list their particular duties and access permissions again as this information can be found in the previous post. The thing that must be mentioned here is that each position executes one or more roles within the company, for example, Stock manager is also an employee, so Stock manager position includes some basic duties as well as duties specific to stock manager. The same goes for Sales manager, he not only have to approve orders but also acts like a sale representative as well as a common employee. Therefore, these positions can be arranged into accurate hierarchical structure according to the rule of inheritance. Luckily, RBAC level 2 declares support for roles hierarchies, and so does our security model. Note, that each role is defined as a separate class. This approach as any other one has advantages and well as drawbacks. It is less dynamic, but provides natural inheritance, doesn't require persistence and is more intuitive, visual and understandable. Moreover, as roles in a company are mostly static, I've found the approach highly advantageous. Look, EmployeeRole inherits a Role class. 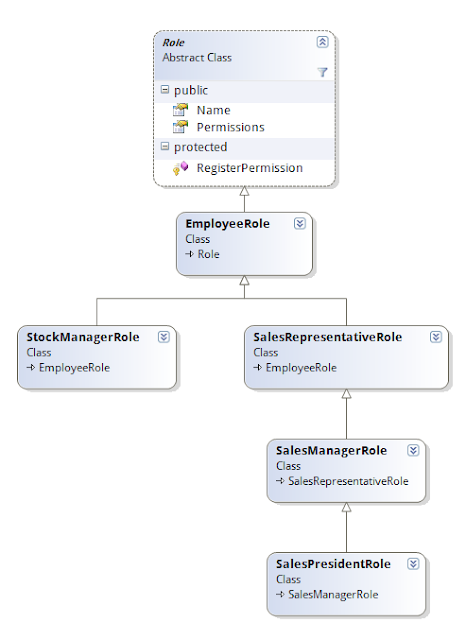 This is the base role class, it provides inheritors with necessary infrastructure: a set of Permissions for a role, name of a role and a method for permission registration. Let's see how these roles and permission are intended to be used. Let's start with the EmployeeRole first. As it is mentioned above, all company positions have at least read-only access to employees & products, we can define the base Role node for this organization and call it EmployeeRole. Let this role is given to any employee in the company. That's it. Now all employees have a permission to read Products & Employees. What about the Stock manager role? Stock manager should inherit the base EmployeeRole and add permission for editing products. As I've already mentioned, the advantage of the class-based approach in role hierarchy definition is in its essential inheritance support. Derived role can inherit all permissions and other options of the base class and override something if is necessary. This is achievable in the most natural way for developers: make an inheritor & override all you need. Note the clarity and the ease of permissions overriding. Peter, that was an absolutely required preamble.